There is a growing concern that too few physicians are willing to accept Medicaid patients. One way to encourage Medicaid supply is to pay doctors more for performing Medicaid-covered procedures. However, we lack a holistic understanding of how changes to Medicaid payments affect access to care among the broader population. Understanding how Medicaid policies affect the breadth of physician behavior, and not just the Medicaid market, is particularly important, because the Affordable Care Act (ACA) will change the entire distribution of insurance enrollments. 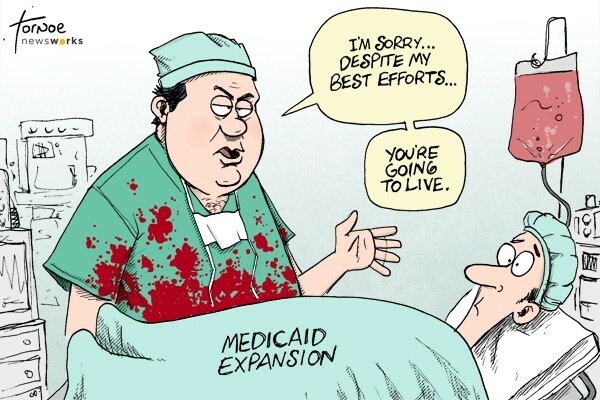 In addition to 11 million new Medicaid enrollees, 24 million people will enroll in private health insurance exchanges, and 30 million people will remain uninsured (Congressional Budget Office 2012). If physicians are unwilling to treat patients with a particular type of insurance, then obtaining coverage may not improve access to care. This concern has already manifested itself among Medicaid patients. 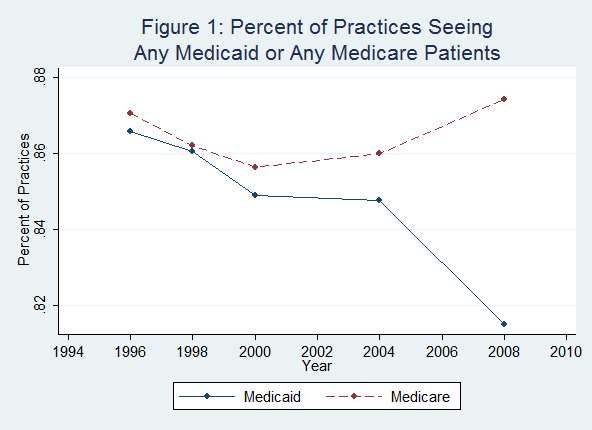 As illustrated in Figure 1 below, the percentage of practices offering any care to Medicaid patients has fallen from 87% in 1996 to 81% in 2008. This figure shows that, over time, the percent of practices seeing any Medicaid patients decreases, while the percent of practice seeing Medicare patients increases slightly. Data Source: Community Tracking Study and Health System Change Physician Surveys. To identify the effects of Medicaid payment changes, I rely on (1) Medicaid payment data from the American Academy of Pediatrics and (2) physician survey data from the 1998-99, 2000-01, and 2004-05 Community Tracking Study and 2008 Health System Change. I then use multivariate regression analyses to estimate how state-specific changes in Medicaid payments affect physician supply over time. The regression results are displayed in Table 1. Column (1) indicates that paying physicians more for Medicaid services results in fewer hours of total of patient care. Which insurance group receives less care? Columns (2)-(5) depict the answer. When Medicaid payments increase, physicians spend more time treating Medicaid and Medicare patients but less time treating charity care patients. Time spent treating the privately insured remains unaffected. Because total hours of care fall, my results imply that the supply of charity care falls by more than the increase in Medicaid supply. In other words, time spent treating a person with either Medicaid or no insurance will fall, as demonstrated in Column (6). When Medicaid physician payments change, it is also important to consider whether there are demand-side responses, measured by changes in insurance enrollment. I find that a 10% increase in Medicaid reimbursements leads to a 2.3% increase in Medicaid enrollments. This increase comes primarily from reductions in the number of uninsured. Perhaps the most intuitive explanation for this phenomenon is that, when Medicaid payments increase, doctors and hospitals are more likely to encourage their uninsured patients to enroll in Medicaid. I shed light on this conjecture by administering a survey asking respondents to identify what factors influenced their insurance enrollment. Survey results confirm that respondents in states with increasing Medicaid payments are more likely to have received encouragement from a doctor or hospital to enroll in Medicaid. By aggregating the demand and supply responses, we can conclude that a change in Medicaid payments induce a 1-to-1 tradeoff between the number of Medicaid enrollees and the number of uninsured, but a more than 1-to-1 tradeoff between hours of Medicaid supplied and hours of charity care supplied. As a result, those who remain uninsured will be particularly worse-off when Medicaid payments increase. Expanding Medicaid eligibility has been one policy the government relies on to improve access to care among the uninsured. Because the ACA increases Medicaid payments while simultaneously expanding Medicaid eligibility, it is essential to understand the impact of these policies when enacted in tandem. To identify how eligibility expansions affect the responses to a Medicaid payment change, I include an interaction term in the multivariate regression. I find that, when Medicaid eligibility is high, increasing Medicaid payments generates a larger increase in Medicaid supply. Furthermore, the sum of hours spent on Medicaid and charity care do not fall by as much. The intuition behind this result is that there are fewer uninsured patients when Medicaid eligibility is high. With fewer uninsured patients, there will be less substitution between Medicaid and charity care. In sum, my research suggests that payment increases should be coupled with eligibility expansions in order to improve access to care among the poor, composed of Medicaid enrollees and the uninsured. However, more research is needed to evaluate the effect of these policies on health outcomes. For example, are the uninsured that enroll in Medicaid sicker than the average Medicaid patient? Do reductions in charity care supply lead to increases in community health clinics or registered nurses? Answers to these questions can better inform policies directed at improving access to care.